Last week my husband was craving chocolate brownies so I got busy going through my family cookbooks and found this recipe for homemade chocolate fudge brownies. 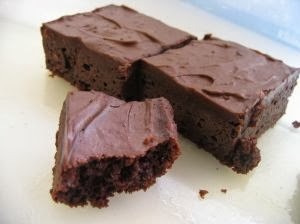 When it comes to brownies, we like ours more on the fudgy side than the cake-like side which can often times be too dry. Here is the recipe that I used. Note: Once they have been baked and are cool, you can lightly dust them with some confectioner's sugar if desired. In a large saucepan melt together the butter and unsweetened chocolate over low heat for 2-3 minutes, stirring constantly. Once it has been melted and is smooth, remove from heat and let stand for 5 minutes (off the burner). Once the 5 minutes have passed, stir int he granulated sugar until sugar has melted and the ingredients are combined. Lightly stir in the eggs and vanilla extract, gently stirring until combined. Blend in the all-purpose flour using a rubber spatula or spoon, keep stirring until batter is smooth and combined. Lightly grease an 8" by 8" baking pan with some butter or spray it with nonstick cooking spray (lightly). Pour brownie batter into the pan. Preheat oven to 350 degrees F. and bake for 20 to 22 minutes or until done. Remove and let them cool in the pan. Once cool, cut them into squares and place the squares into an airtight storage container. How to Print Recipe: At the bottom of the post is a share button. Click on button to see options and then click on PRINT. A new window will open with the recipe inside it for printing purposes. Enjoy!